Ron's son Lee got in touch and asked if his father's memories could be added to the website. He provided three stories: two specific to Bath, the first (this page) when Ron was 11; the second covering the nights of the Bath Blitz when Ron was 13. The third story when Ron was 15 covers his memories of going to London to help repair the bomb damage there. This third story is provided as a file which will appear in a separate window. I was 11yrs old and the year was 1940. My two brothers, Tony and Dennis and myself were attending Widcombe Junior School. Our summer holidays that year were overshadowed by talk of the believed inevitable invasion of Great Britain by the German forces. France had fallen and the Battle of Britain was taking place. At our ages it was both an exciting and scary time. I can remember the local Home Guard being very active at that time, but everyone tried to carry on as normal as possible. It could not have been easy for most adults in those uncertain days. We were all aware that a German invasion was likely because we had witnessed the Home Guard and the Air Raid Wardens carrying out their training. Heaps of stone and timber had been spaced at intervals in the fields to foil the enemy gliders and paratroopers, and there were road blocks everywhere. I used to read the daily papers avidly in those days, about the bombing of London and other cities. At 11 years of age I was the eldest, my brothers being ten and eight. One of our favourite 'playgrounds' at that time was Prior Park gardens. We and our friends played on the lake and in the woods regularly. When the staff and pupils were on their August vacation, we were left free to roam. There was in those days, an old punt at the side of the lake. We used to cut sticks from the woods, sharpen them to a point and try spearing fish from the boat, (we never caught anything). The punt had a leak at one end so we made our young friend Robert stuff one of his socks into the hole and also used a tin can to bale the water out. We could also swing from the creepers that hung down from the trees, playing at being 'Tarzan'. You might say that this was how this particular event came about. It was whilst we were swinging around in the woodland that my brother Dennis, scraping his foot along the rough ground, exposed part of an iron ring in the undergrowth. On clearing away the earth, we found the ring was attached to a wooden hatch cover. Of course, being curious we pulled the cover up and discovered a deep shaft with a vertical wooden ladder going down about ten feet. More and more intrigued we went down the ladder and at the bottom was a dug out room measuring about 8ft by 5ft. At one end of the room was a table and on it, in the gloom, Tony found a storm lantern. I always had matches in my pockets in those days so I lit the lantern. We looked around in great surprise. There were chairs around the table, and along one wall were about four bunk beds. The biggest shock we had though was discovering guns and ammunition in boxes along the opposite wall. Then Tony shouted, "Hey, this lamp was made in Germany!" There it was clearly stamped on the lamp. So that was it, we had discovered a German spy hideout! But what were we supposed to do? Well we all decided that we had to inform the police. The newspapers were full of stories about German sympathizers in those days, called "Fifth Columnists". I thought we had discovered one of their spy holes. So, covering up the pit and hiding it as before, we set off. Bath Police Station was in Orange Grove in those days, next to the Empire Hotel. It had formerly been used as the Fire Station. All four of us crept into the front office of the station. We could just about look over the counter at a police sergeant who looked, to us, about ten feet tall. "Well, what do you lads want?" He bellowed. "Please sir, I think we have discovered a German spy hideout" I said to him. "Oh yes, and where is this hideout" he said. So we explained what we had found at Prior Park, and by this time quite a few more policemen had gathered around us. We must have been quite convincing because, although they didn't have a clue about what we were telling them, they contacted our parents to let them know where we were, then took us in a police car back to Prior Park. Having proved to them that we had indeed found a secret hideout, they took us back to a waiting room at the station. Although at the time, Ron and his friends thought they had found a German spy hideout, it is almost certain that what they had discovered was the Operational Base of the Admiralty No 4 Patrol of the Auxiliary Units. See also COMMENT below. After a little while, we were interviewed again in the presence of Major Lock, who was the officer in charge of the local Home Guard. We knew of him because he lived in a house on Widcombe Hill. But the Major admitted that he was also unaware of the hideout we had found. Eventually we were allowed to go home after solemnly swearing that we would not divulge anything about the whole affair. And also vowing that we would not go into Prior Park woods again. Of course, our parents had to know what had happened and they must also have been cautioned to keep mum about it. All of us involved in this escapade kept our silence about it, and in fact, it remained almost forgotten for nearly fifty years. Only in recent years have we mentioned anything, after the story of Winston Churchills' secret army came out. An informal army of local, trustworthy, and countrywise men and women was formed to harass the enemy had they actually managed to invade the British Isles. About two years after this episode, we did return to the woods at Prior Park, but were unable to find any evidence of the hideout. After Ron's story went on the website, I received an e-mail with some additional information from someone identified only as "Harry" about the hideout that Ron and his friends had found. The structure was originally the Ice House for Prior Park. When it was converted into an Operational Base a new entrance was dug because the original would have been too difficult to camouflage. 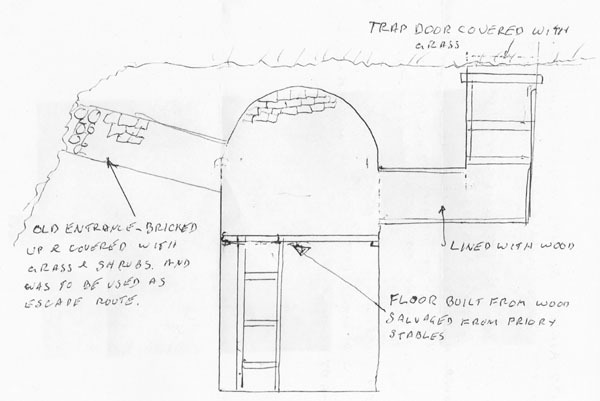 Harry's sketch is on the right, which was supplied with the following explanation of the status of the hideout at the time Ron found it. This was when the threat of invasion was over. We had removed all explosives several weeks before this, and I am afraid the camouflage over the entrance had been neglected after that. You can read more on the Auxiliary Units: the organisation, the memories of a member, and his memories of his activities in the Bath blitz. I understand that the Ice House has been restored as part of the recent work on the Prior Park gardens, although there are no intentions of opening it to the public. But until this story was published, the archaeologists were unaware of its use as an Operational Base, and were baffled by the holes and occasional brackets on the walls (which had held the Operational Base structures) because no Ice House functions could explain why they were there. Ron's story enlightened them. Ron Frost has also provided his memories of the Blitz Weekend which you might want to read next. And in a separate window his memories of going to London to help repair the bomb damage there.